The political map of Honduras will change for ever after last year’s political crisis, in which the vast majority of the Liberal party, supported by the main opposition party the Nacionalistas, and most of the small parties, denounced the Liberal president Manuel Zelaya after he had violated the Constitution and Supreme Court orders. For which the Supreme Court ordered his arrest by the military. This has left the Liberal party, a party that has won 2 out of 3 elections the past 28 years, split. The left fraction around Manuel Zelaya and his ex foreign minister Patricia Rodas – who grew up in sandinista Nicaragua and clearly has her political ideology colored by that fact – has now decided to throw in their chips with the FNRP. They call themselves the “resistance” movement, in reference to a resistance against what they claim to be a “coup d’état” (i.e., the arrest and removal from office of Zelaya on June 28, 2009). When the dust has settled, perhaps there will be three main parties instead of two in Honduras. That this is possible we see in the UK. The three might be a leftist party around FNRP (which will perhaps eventually drift to social democratic ideals rather than socialist ideals); the Liberal party based on liberal ideals; and the Nationalist party based on conservative ideals. A problem now is that the FNRP is not accepting the legitimacy of the present government of Honduras, and thus not of the Republic of Honduras as such. From my Swedish background that is an absolutely outlandish position–and I mean that quite literally. A person who did not accept the law of the land was an outlaw, in the ancient jurisprudence of Scandinavia, and he had to seek refuge in the “outland” (i.e., abroad or in uninhabited land) since he was not protected by the law. Such a person could be killed without punishment. With the development of international law things have of course changed now, but that ancient principle is a foundation for the modern concept of nations, ever since the Peace of Westphalia: It is implicit that all citizens of a state must obey the laws of that state, or leave it. What FNRP is saying would be a crime in some countries, but in others it would not be a crime until they went from words to action. But regardless of the legality of it, what they are doing is, politically speaking, a very foolish and immature thing. And perhaps that is why the ruling party is allowing them to continue, because it benefits the Nationalists. This is a pity, because Honduras really needs reform, and the FNRP has got some legitimate grievances. However, their leaders seem to lack political savvy, democratic experience, and wise advisers–or if they have, they don’t listen to them. Their whole strategy is based on them writing a new constitution, from scratch, even though it is unconstitutional according to the existing constitution, which they consider no longer to be valid. The problems with their position are, however, first that a large part of the population considers the existing constitution to be legitimate why the FNRP one automatically will be illegitimate (and according to the existing constitution all Hondurans must then restore the existing, which means the country will be split). Secondly, even if they manage to impose a new constitution, they will have done it at the price of undermining the rule of law, why it will be a Pyrrhus victory; what they really will have accoomplished, if they succeed in their enedeavor (which I find higly unlikely), is to establish the Law of the Jungle as the supreme principle in Honduras. Thus, whether they succeed or fail in their strategy, they will fail to achieve their goals. What they need to do is to change strategy. And now I will give them some advice on what to do instead. To achieve a functioning democracy, they must demonstrate that they are mature enough to take on the responsibility. They must participate in democratic meetings. They must demonstrate that they are ready to accept majority decisions, and implement them even if they initially voted against them. When Micheletti was interim president he invited many of the present members of the FNRP to discussions, but they refused to attend such meetings. That was a childish reaction. It is true that meetings can be used for trickery, and they had reason to be weary, but it was unwise not to engage when the hand was streched out in search for a compromise. They had a position of power from which to negotiate, but they threw the opportunity away. They no longer have a position of power from which to negotiate. Most countries have recognized the new government, and those that remain are getting increasingly isolated internationally, as Chávez is seen more and more as a dictator and terrorist-supporter by the week. They blew their best chance, and now they have to start with a new strategy. That is why I advice them to start by demonstrating their committment to democracy, to the rule of law, to democratic meetings, and to following the rules. Only by doing that can they gain the confidence of their political opponents, a confidence that they need in order to negotiate reforms. They have to prove themselves as trustworthy partners in the business of managing the public good. They have to gain that respect. The next step is to analyze the constitution and propose reforms that can increase democracy, prosperity, and transparency (thus decreasing corruption). All of this analysis has to be done, and debated publically, before the actual reforms to the constitution are proposed in Congress. This is necessary in order to gain legitimacy and public support. As for possible reforms that may improve conditions in Honduras, I have previously proposed the introduction of parliamentarianism, thus reducing the president to a largely symbolic head of state. This can be done within the confines of the present constitution, as far as I can judge. The president cannot be reelected, but a prime minister could, meaning that in a parliamentarian system the FNRP could get that continuity that they apparently think is so important, while at the same time preventing caudillos from taking over, something that the right is rightly concerned about. Furthermore, I would recommend the drafters of the constitutional reform to study the Swedish constitution and laws as regards the prohibition of politicians to deal with individual cases. This is a way to mitigate corruption. Note that the Swedish constitution no longer is based on the principle of power sharing, but on the sovereignty of the people. All power emanates from the people and is exercised through their elected representatives in parliament, city council, etc. In Sweden those elected cannot interfere in specifics. They hire someone to do the specifics, and all they can do if they don’t like his job is to fire him. Also, the elected persons can only take decisions in a group by voting in a formal meeting, that has to follow very specific rules (designed to prevent “palace coups”). Their main job is to set policy, and supervise that the implementation of the policy by the administration (meaning those who are employed, non-political persons) is as intended. In the US they elect people for actual jobs. The problem with the US approach is that it leads to corruption. Instead of a corrupt permanent office holder, there is instead corrupt temporary office holders – unless the person is beyond corruption. The Swedish form of representative democracy is designed to prevent corruption not through the threat of loosing the next election, but by design, while they are still in office. Also, it allows for persons to be hired based on competence, rather than elected based on fundraising ability. Since the state pays for university education, including in public administration, there are lots of people with a dedicated education for the task. While in the US, many officials have an education designed for the private enterprise, which is a different beast than public administration. There is another key difference between USA and Sweden on the one hand, and Honduras on the other, that tends to be forgotten (although the UN takes it seriously and considers it perhaps the most important problem to deal with). And that is local sovereignty. Swedish kommuner (communes) have local sovereignty, meaning they can levy taxes and decide how to use it. There are two levels of kommun, corresponding to departamento and municipalidad in Honduras. Both have an elected council, but no mayor (Sweden and Finland are the only countries in Europe that have no mayors as far as I know). Instead they are governed like a corporation in Sweden: The council hires an administrator (equivalent to a CEO), and he is in charge of operations. The council decides policy and supervises the administration, but does not decide individual cases. This latter is in stark contrast to the US, where the councilmen decide itty bitty details. Honduras has very weak local sovereignty, and that may actually be a key thing that needs to change. Money is spent better locally, and corruption is fought better too. Furthermore, local democracy with budget responsibility will foster more responsible citizens, and activists who try to work for results rather than take to the streets and demand action like overgrown children. Congressmen and -women of Honduras: Give the people local budget responsibility, and watch them start working for bettering the roads, instead of blocking the roads! There is in Honduras a grouping calling itself “the national popular resistance front against the coup d’état”, FNRP. Before scrutinizing their agenda I just have to comment on their name. As is now known, the coup d’état was perpetrated by Manuel Zelaya, but it was stopped by the checks and balances, the democratic institutions of Honduras. However, it is not that coup d’état which this organization is referring to in their name. They are referring to the action to stop the coup d’état, when they say “coup d’état.” However, according to my analysis, it was a coup only in form, not in substance, as neither the constitution was changed, nor any president was put in place who would not have been president if all the formalities of the constitution had been followed to the letter. One may describe the events with this similitude: Zelaya was in his office, and committed a crime. The court asked the military to fetch him. To prevent him from returning they booby-trapped the door. Micheletti was sworn to take care of business in Zelaya’s absence. He climbed in through a window, since the door was booby-trapped. Seeing this, the police was called, thinking he was a burglar. This is a relevant similitude, since the actions of the military prevented Micheletti from being made interim president in the appropriate way, but he still had an obligation to run the office in Zelaya’s absence – and Zelaya was not coming back since all he faced was his immediate arrest. Nevertheless, FNRP considers Micheletti’s “climbing in through the window” to be a coup, and they consider the attempted overthrowing of the form of government by Zelaya not to be a crime. What is the argument of FNRP? Their argument is that the power of the Congress and the President emanates from the people, and is only delegated to them. Therefore, they argue, the people can take that power back. They claim that they, FNRP, is the true representative of the people, not Congress, nor the President. They argue that their self-appointed organization is more democratic than the will of the people as expressed in democratic elections every 4 years, latest on November 29, 2009. Furthermore, they claim that the appointment of Roberto Micheletti as interim president on June 28, 2009, was a coup d’état, and as a result of that, they argue, the Constitution has ceased to be in force. Therefore, they continue, since there is no Constitution of the land, it is appropriate to hold a Constituting Constitutional Assembly in order to write a new Constitution from scratch. For good measure, Zelaya is also asking the Inter-American Human Rights Commission of OAS to declare the replacement of Zelaya a coup d’état, and to order Honduras to hold a Constituting Constitutional Assembly. What is the plan of FNRP? Not able to find any such document online, I proceeded to seek information (through a mutual acquaintance) from Congresswoman Carolina Echeverría, from Depto Gracias a Dios. She was one of those liberal party congressmen and -women who objected to the way in which Micheletti was appointed interim president on June 28, and she is, I’ve been told, one of the top leaders of FNRP. I appreciate that she was willing to share some information with me for use on this modest blog. 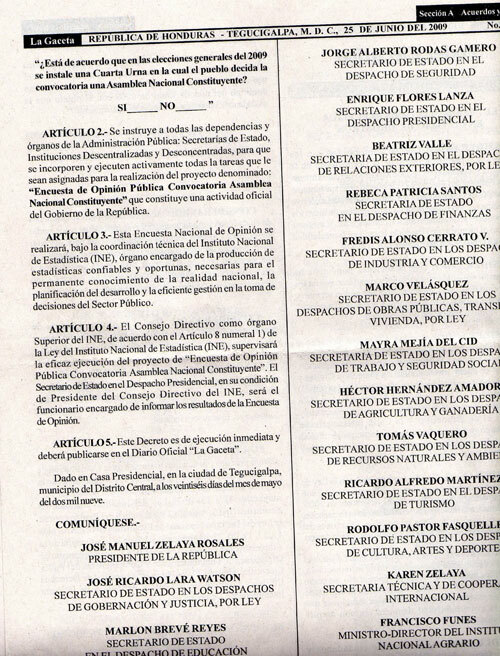 According to Echeverría, a Constituting Constitutional Assembly is being prepared for June 28, 2010. A new constitution is being drafted by a working group. However, the process is not open. The general public does not have insight into what it may contain, nor can they contribute with input. What can FNRP hope to accomplish? If the debate and the meeting are not open, then the whole process becomes a special-interest partisan effort that will have no impact on mainstream Honduras. The only way in which it can become relevant is if they force it on the rest of the population. Since this is unconstitutional, there are only three ways in which it can happen: A coup d’état, a revolution, and a foreign military intervention (cf. previous post). I think we can rule out revolution and war, which leaves only the coup alternative. Is there any reason to suspect that the present president might attempt the same kind of coup as Zelaya did? Unfortunately, the answer is not “no.” Pepe Lobo was sent by the Honduran communist party to study in the Soviet Union. He denies it, but a person I interviewed assured me he has talked to three persons who studied together with Lobo in Moscow, and although two of them are now dead, the third is still alive and can bear witness about it. What makes this suspicious is not that he studied there for a few months, but that he is assuring that he didn’t. Furthermore, Lobo was initially positive to Zelaya’s plans, until the wind turned against it. Finally, an FNRP-connected source has told me that the party of Lobo, the Nacionalistas, are participating in the drafting of the new constitution. Here I should point out, that if any elected politician in any way proposes or facilitates changing the presidential term limit, they would immediately lose their elected office, and be ineligible to hold any elected office for 10 years, according to §239 in the Honduran Constitution. Therefore, they have every reason to hide their participation in this process. The Nacionalistas don’t just have the presidency at present, they also have a majority in Congress. The only branch they don’t control is the Supreme Court. Assuming that the above is correct, what may happen in the worst case scenario is that the Nacionalistas decide to vote in Congress on a motion that simply recognizes that the present Constitution is null and void (by being violated by the alleged coup last year, that they themselves voted for incidentally, but what says they have to be logical and consistent?). The next step would then be to vote to recognize the legitimacy of the Constituting Constitutional Assembly and the new constitution. That constitution would obviously throw out the present Supreme Court, since that is the only institution capable of stopping such a coup. If the military obeys the president (who has replaced the entire leadership of that organization since the coup attempt by Zelaya), then this might succeed. Is this likely to happen? No. But if it happens, it would be a big setback for democracy and the rule of law. How can the threat be diminished? First we have the legal means. Already now, any elected official that in any way, shape, or form violates §239, should be indicted and separated from office awaiting trial. Since contributing to drafting this new constitution would be a violation of §239 (and more), this may be the reason why the process is not open to the public. However, even advocating the holding of a Constituting Constitutional Assembly may violate that paragraph. The problem with this method is that it may backfire seriously in the field of public relations. Therefore, I would advocate primarily using political means. Members of Congress who are opposed to constitutional coups can deflate any popular support the FNRP might have, by taking the initiative in the efforts to (legally) reform the constitution. Indeed, Congress itself can start an open and transparent process with citizen participation. It could take the form of a website for debating the need for, and proposals for, constitutional reform. Since only Congress is authorized to change the Constitution, it only makes sense if Congress itself does this. Of course, they should use experts in designing the user interface, but staff or representatives should engage in the debate and the wording of proposals. Although there are some unchangeable paragraphs in Honduras’s Constitution, I don’t understand how those points in any way could prevent progress. There can be no democratic reason to write a new Constitution, as reforming the old one is perfectly adequate. Anyone who argues otherwise must be suspected to be an anti-democrat. If Congress takes the initiative, the undemocratic forces can be marginalized so they no longer can prey on popular discontent. Undemocratic forces on both extremes need to be separated from the mainstream, so a civil debate can take place within the mainstream. Personally I am quite optimistic about the possibility to do this in Honduras. I believe that many of those who most loudly claim that it is impossible, are the very extremists who we must marginalize. Those are not the ones to listen to, they should be turned off – or just switch channel. It has struck me while following the constitutional crisis that erupted in Honduras June 25 last year, that many of those who are actors in the drama do not seem to have an understanding of democracy on a philosophical level. Without a normative foundation, they end up being blind to the long-term implication of their choices, and are guided only by the immediate benefit they see. To overcome this problem I believe it is essential to strengthen the knowledge and understanding of democracy, not just in Honduras but in all of the Americas. Yes, including the U.S. of A., the Senate of which appears quite unable to function in a democratic way. In fact, I would propose that this task should be based on the most fundamental of levels, i.e., on the philosophical level. There is an academic subject called Political Philosophy, which overlaps with what I propose. However, not all democracy is politics, and not all politics is democracy. Democracy is a method of decision-making also outside the political arena, i.e., in societies with voluntary membership and an idealistic purpose, and in corporations (although there the principle is one share = one vote, not one person = one vote). 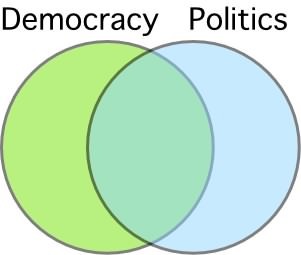 Democracy and politics overlap, but a large part of democracy exists outside of the political realm. Democracy in non-political contexts is fundamental in Sweden. Since my early teens I was exposed to the workings of democratic organizations, holding constituting meetings, yearly assemblies, board meetings, and so on. It was a way of cooperation that we took for granted. The formalities were key; although the actual work was quite informal, the formalities were rock solid and always solved any potential conflict before it could grow out of hand. In that sense, the democratic method of holding meetings and taking decisions was a tool for preemptive peace and conflict resolution. Perhaps it is because the challenges of managing a club with 15 members, and a country of millions, are so different, that we don’t think of them as being related, both being aspects of democracy. Often, especially in the U.S., democracy is thought of as almost a synonym for politics. That in turn is thought of as the intrigues and manipulations of the specifically anglo-saxon form of governance (that has also been exported to Greece), of type “the winner takes it all”. This means that democracy and politics is largely focused on winning elections. In fact, in the U.S. this has gone so far that the very word politics has come to mean only that aspect, and not the art of making decisions. As I wrote in Democracy for Dummies, the core purpose of democracy is of course to make decisions, not to get elected. It is to make decisions that have legitimacy, that are universally respected, and that can bring the issue forward while avoiding conflicts. The core process in democracy is therefore the meeting (in which the decision is taken), not the election of representatives (which is, incidentally, a means to a means to an end: we elect them to take part in meetings to take decisions on our behalf). In my opinion, for the purpose of classification and analysis, the most important distinction to make visa-vi democratic organizations is in those with voluntary membership, and those with involuntary membership. Organizations with voluntary membership are democratic clubs and societies. This also includes typical political parties (note that U.S. political parties are atypical). In the typical case membership is open to everyone who wishes, but subject to some condition, such as paying a fee. In other cases it may be an invitation-only club, but that doesn’t mean it cannot be democratic. Organizations with involuntary membership are those where membership is implicitly or explicitly required for persons in certain circumstances. The most obvious example is a country, in which the members are the citizens. Another example is a condominium association, in that you have to become a member (and be accepted as a member) to buy the apartment. Obviously, organizations with involuntary membership in some ways infringe on the individual’s freedom. The very term “involuntary” conveys that. Of course one can leave it, but only if you give up something (e.g., the right to run for election, the possibility to live in a certain apartment). It is therefore only to be expected that most focus is put on this class of democracies. It is also worth considering that certain rights can be delegated to an organization with involuntary membership, for instance the right to defend ones rights with force. That is the basis for the common defense, and for a police and judicial system. Note that it is not a requirement to have a police force, for instance. In pre-historic Scandinavia there were no policemen, no prosecutors, no justices, no jails. Instead, someone who had broken the law was dealt with in the same way and at the same meeting as all other business, with all the people voting. The worst punishment was to be declared an outlaw, to no longer to be protected by the law, as it was not a crime to kill an outlaw. It seems to me that the traditional studies of political democracy are done from a biased position, i.e., from the implicit assumption that the state comes before democracy. But it does not have to be that way. What I propose is to study democracy as a subject in its own right, and see what that leads to in terms of the requirements on the state. It also seems to me that this has some urgency to it, since there is a rather strong political movement towards re-inventing democracy, namely “The Bolivarian Revolution” a.k.a. “Socialism in the XXI Century”. This is of course the project of Hugo Chavez with the moral support of Fidel Castro. However, there seems to be no scholarly foundation under this building. It therefore risks wreaking havoc and creating utter chaos in the countries where it is implemented, such as Venezuela. Honduras recently stopped this change in its tracks. It gives them breathing room for analysis and thought. I would propose that they use this opportunity to seriously analyze the philosophy of democracy, and come up with a workable solution to obtain the objectives without getting into trouble with human rights, loss of economic activity, and other predictable risks. After seven months of hardship, Honduras can today consider itself the victor in the drawn out struggle for the world to recognize its right to depose an omnipotent president. This is the day the interim president gave his final speech to the nation from that position. He thanked the people, all the people, for the help they had given him, and he expressed profound gratitude for the opportunity destiny had given him to serve his fatherland in these the most arduous of times. This is also the day that it was revealed that BCIE, Banco Centroamericano de Integración Económica, on January 18 decided to resume normal operations with Honduras again. Honduras is a partner in the bank and has sued it for breach of contract, since it for purely political reasons stopped making payments. Also the Central American trade agreement with the European Union is back on track today, with Honduras included. It is expected to be signed in May. As for the future of the deposed president, Zelaya, he has today decided conditionally to accept the free passage to the Dominican Republic that president-elect Porfirio Lobo has promised to issue on January 27, the day he takes office. There may also be legal problems due to the arrest warrants issued for him – including international ones. Logically, if Zelaya accepts the free passage he recognizes that Lobo was elected president of Honduras in a legitimate election (which he hasn’t done yet), which means that he also has to accept the validity of the arrest warrants from the Republic of Honduras. There are still some knots to untie. 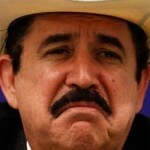 The easiest would be if Zelaya just walked out and faced his prosecutors like a man. However, those are details now. The main thing is that Honduras democratic institutions saved the rule of law, enforced the separation of powers, and – when the entire world turned on them – stood up for what they knew was right, and won. This is perhaps a first. History is full of countries that have had their democracy destroyed, from ancient tyrants to present-day chavism. Every time one wonders, why didn’t they stop it? Why didn’t they do this, or that? Why not? Well, Honduras did to this and that. They had the right on their side, and executed it under extreme pressure, against an opponent that was acting fast. They had no time to plan; in fact, they barely had time to act. Most of all, they had no time to spin it for the media. Their opponent had, though. He was well prepared for virtually all eventualities. Which forced the Hondurans to take some extreme and unexpected measures. Call it “pajamas diplomacy” if you like. Although in reality Zelaya was of course allowed to get dressed before they flew him to Costa Rica. This left the impression of a military coup. Due to the circumstances, the country was already full of media ready to spread the story. Result: Instant saturation of the global airwaves with the spin that a military coup had taken place, while in reality they had prevented an autogolpe. So now we know “why not”. It is very, very hard. But they did it, and for that, the little country on the Central American isthmus, the former “banana republic” of Honduras will for ever be inscribed in the History of Democracy. And so will president Roberto Micheletti Bain, and his last speech. As a personal note, it has been an astonishingly interesting time to have had the privilege to be able to follow closely the fight of this government to preserve their nation’s freedom and democracy. 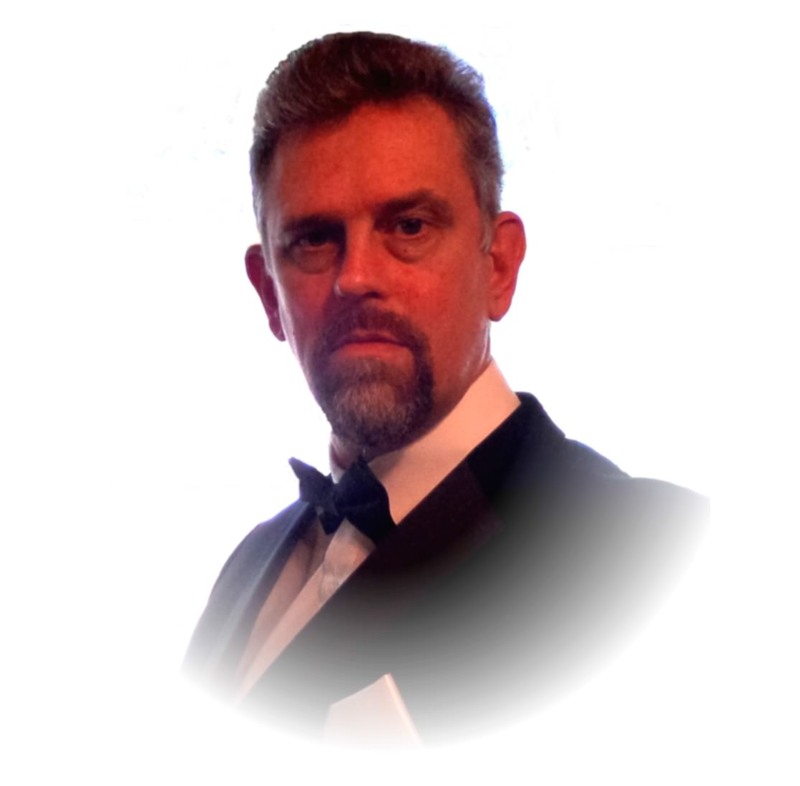 I want to sincerely thank all those who have helped me with information, because it is they who have made it possible for me to get beyond the clichés. ¡Viva Honduras! 2010-01-22 11:40, corrected to Dominican Republic as the country accepting Zelaya. Marking the end of an over 4 month long political crisis, during which the international community has refused to recognize the interim president appointed by the Honduran congress, replacing the one deposed for crimes against the form of government, the democratic institutions of the country have now won. After failed negotiation attempts by the Costarrican president Oscar Arias, who put as a condition in the so-called San José Accord that Zelaya be re-instated, the talks moved to Honduran soil when the exiled president returned to Tegucigalpa and took refuge in the Brazilian embassy on September 21. This “Guaymuras Dialog” rapidly revealed a rift on the Zelaya side, in that the so-called resistance movement that has backed up Zelaya on the streets, with acts that too often turned violent, refused to give up the demand that the constitution of the country be overthrown. Only after they were removed from the talks could progress be made. Since also the other side has claimed to be concerned about the constitution – except for the resistance movement that is – there was a common ground on which to negotiate a peaceful settlement. The settlement says that both parties, the deposed president and the interim president, defer back to the democratic institutions to settle the matter. The real victor here is thus the National Congress of Honduras, the people’s democratic representatives. In other words, the winner is the people of Honduras and the democracy as such. In many states throughout history a strong man has tried to consolidate power in his hand, at the expense of the parliament. Honduras is one of those rare but inspiring cases in which the democratic institutions held their own, and stopped the wannabe dictator. This is the first major setback for Hugo Chávez of Venezuela and his pseudo-democratic “Bolivarian Revolution”. After Venezuela similar power grabs have been carried out in Ecuador, Bolivia, and right now a constitutional coup attempt is under way in Nicaragua. The victory of Honduras’ democratic institutions in defending the constitutional democracy apparently scared the living daylight out of Chávez, who is now spewing sulfur over Obama in his speeches – partly for the bases in Colombia, partly for his role in getting the Guaymuras Accord finalized. The final concession was from Micheletti, who agreed that Congress, not the Supreme Court, should have the final word on whether Zelaya should be reinstated or not. From what I gather the lure brought by undersecretary Thomas Shannon was a carrot, not a stick, because as soon as the ink was dry on the paper the U.S. promised to immediately start normalizing the relations. Thus, the U.S. is normalizing the relations based not on the reinstatement of Zelaya, but on the parties acknowledging that the ultimate decision rests with the Congress. This is the important take-away for Latin American democracy. The president is not supreme; he is just serving the people, and he has to follow the constitution and respect the other branches of government. A new page just opened in the development of democracy in Latin America, and it was turned by Honduras, a most unlikely champion for democracy given its history of military coups. 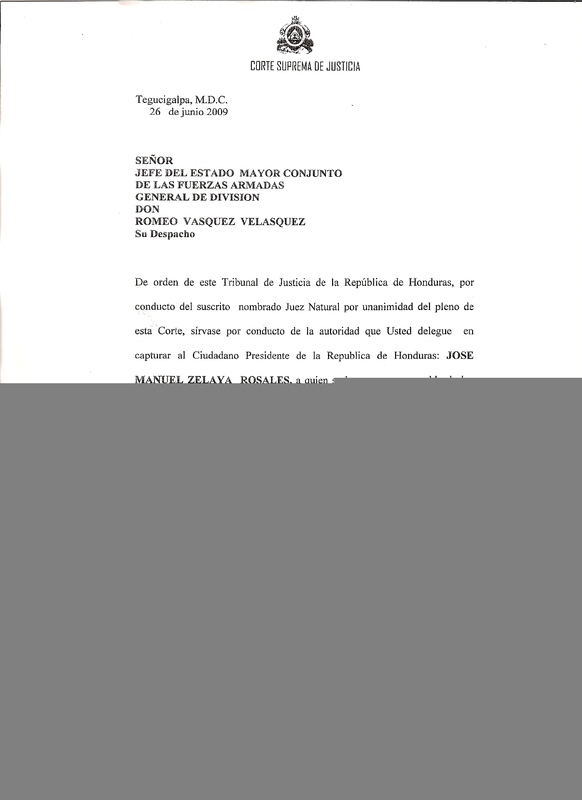 Background: President Manuel Zelaya issued a decree on holding a poll regarding a constitutional matter on June 25th, 2009, in direct violation of a Supreme Court cease and desist order, which led to an arrest order being issued for him by the Supreme Court, executed by the military on June 28th, after which the National Congress appointed Roberto Micheletti as interim president to serve until January 27th, 2010. Every state has two classes of potential enemies: External, and Internal. The defense against external enemies is allowed in the UN charter, as every country has the right to defend itself if attacked militarily. The defense against internal enemies is an internal matter, though. A revolution in a country is not a matter for the international community. For this reason, if one state wished to take control of another state, the only method that they can get away with is to disguise an overthrow of the constitution as an internal matter. Such an act would not violate any international law, only the national laws in the country under attack. An attempt to overthrow the constitution or government is in Honduras called “delito contra el forma de gobierno,” meaning ‘crime against the form of government.’ In Swedish law that is called “högmålsbrott,” which is subdivided into “uppror,” i.e., revolution, if it is a domestic affair, and “högförräderi,” ‘high treason,’ if it is done with foreign assistance. This is the most severe crime that Zelaya is formally accused of. The institutions in charge of defending law and order in Honduras acted according to their purpose in defending the country from an internal threat, when Zelaya was removed from office. A new president was installed, a new government set up, and the constitutional continuity was preserved. If this had been an internal Honduran affair it would have ended there, but it wasn’t. The attack against the form of government was directed from Caracas, Venezuela. Using media, Zelaya’s co-conspirer Chávez managed to dupe the world into believing that there had been a military coup d’état. As a result, he managed to get all international institutions on his side, against the constitutional democracy of Honduras. Chávez also relied on paid demonstrators and rioters within the country, amplified by people with limited understanding of the laws who genuinely believed that a coup had taken place, and who were strengthened in their belief by the whole world saying so. However, Honduras is and remains a democracy, defending itself against an assault on its very fabric. The assailants have used peaceful demonstrations, violent demonstrations, riots, propaganda lies, staged clashes for media effects, and more, all to portray the democratic government as a repressive military regime. While most serious media have managed to filter out most of the propaganda lies, they have still swallowed the basic lie that it was a coup, and many bloggers and online media have spread even the hysterical lies. Well-intended but ignorant and naïve “help workers” from richer countries have become propaganda mouthpieces for the anti-democratic forces in this upside-down world, where the real coupsters accuse the democratic institutions of being coupsters. It took many weeks but slowly the conditions in the country returned towards normalcy. Until Zelaya returned and sought asylum at the Brazilian embassy, and from there tried to rally a mob to overthrow the government. This created a new situation of internal threat to the form of government, since both Zelaya and the mob leaders professed to wishing to overthrow the constitution. At this point, about 3 months after exiling Zelaya from the country, the democratic government saw itself compelled to declare a state of emergency (called “estado de sitio,” literally ‘state of siege’). In agreement with the constitution, certain civil liberties were suspended for a limited time in order to control the internal threat that the country was facing. This attack against Honduras is very real, it is very well orchestrated, and it came within hours of succeeding. If it wasn’t for the determination of key persons at the democratic institutions in Honduras, the democracy would have fallen. Among Latinos in Miami, Honduras is looked up to. Their perseverance in the face of the whole world just adds to the admiration. A lesson that they have learned the hard way is that having a very large social gap in the country is a security risk. Even if there is no domestic revolution, as in Russia and Cuba, it opens the door for foreign-supported coups as the one Zelaya attempted in Honduras. Hopefully the ability for all citizens to participate in the democratic process will be addressed in Honduras as a result. It is also quite likely that the constitution will be amended as a result, but legally, and not in the way that Chávez wanted. A proposal that has been suggested is some form of parliamentarian system, whereby the executive is elected by the congress so that the head of government cannot so easily be bought as today (Zelaya is allegedly in debt to Chávez to the tune of $400 million). PS, added 2009-10-18: On 2009-10-10, New York Times ran an opinion piece that clearly outlined how the real coupster of June 28th was Manuel Zelaya, and that his ousting actually prevented the coup, rather than being the coup, as the world has come to believe based on Chavez’ propaganda.